This was a surprisingly solid novel. I was dubious about the premise of a Die Hard-like story set in a Disney World analogue, but Rucka pulls it off with aplomb. The crafting of Wilsonville, from its history to the mythology behind the characters and the way in which they interact, was very well done - I think I'd rather vacation there than DW any day (well, except the day of the attack...). Jad Bell is an interesting character, competent but at least moderately realistic in the sense that while he's your typical "Tier One" type, there are a number of little details that give him a surprising degree of humanity. The choice of making his teenage daughter deaf, and weaving in chapters written from her perspective, gives this story a very unique feel. I also appreciated the complexity of the sleeper agent, his relations with the other terrorists and his superior, and the chain of planning and events leading up to the attack. The door is definitely left wide open for more books in the series. 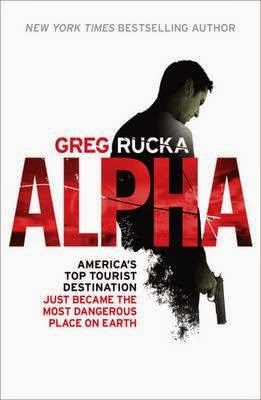 I have been a fan of Rucka's since he wrote the excellent spy comic QUEEN AND COUNTRY, and I read his Wolverine titles as well. He's written some Punisher too, although I haven't checked it out yet, but after reading ALPHA, I think I need to make it a priority. This novel is highly recommended, and I'm eagerly awaiting the next book in the series.